Finally sun again. My studio catches lots of natural light. But with all the cloudy weather we had been having, I needed to turn on lights. They just do not reflect the color the same. I find I change my color combinations with natural light compared to electric lights. Though, that can make the painting more interesting, I prefer natural light. I should not complain. When I first moved to Nashville I worked in a warehouse without any natural light, no heat and no air conditioning. During the summer my paint would dry too fast to mix color on the palate and, have it stay liquid while I applied the color. During the winter my fingers were so cold it made holding the brush difficult. I shared the warehouse with some interesting people, which did much to offset the lack of heat and air. 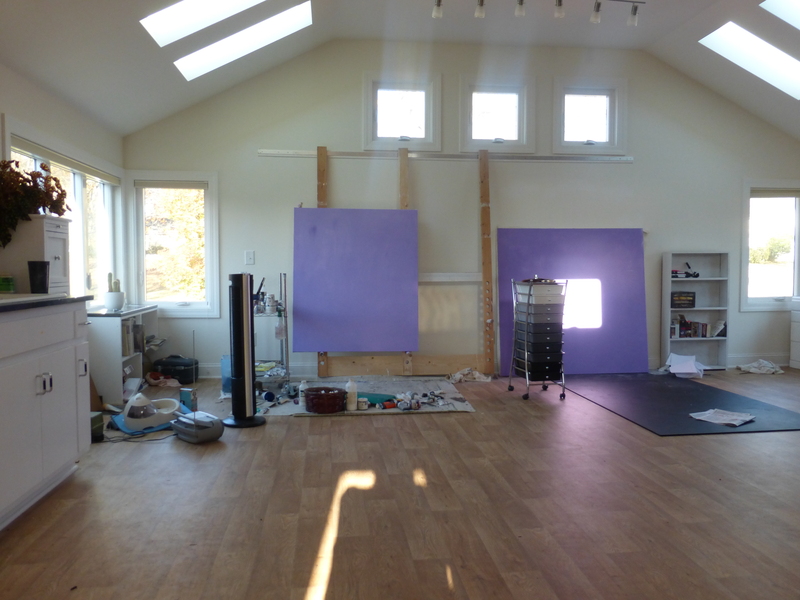 The sun shining into my studio after the days of very little light makes the studio and me much more cheerful. I read an Op. Ed piece in the Nashville newspaper not too long ago. The writer was concerned with the method that Tennessee had been electing appellate court judges. He felt that having a committee of informed lawyers and lay people reviewing the first year or so of the appointed judge’s service via interviews and reviewing the cases, followed by making public the result – including an approval/disapproval recommendation, was not giving the voters a fair chance of electing a judge. Personally I would find it very hard to know who would make a good impartial judge. I do not follow trials; I do not know the law. On the other hand, I find it very helpful to be informed by an impartial, knowledgeable committee. To me, this keeps judges honest. Indeed, I would like it very much if we had such a rating/review system for those who run for lower court judgeships. In nearby West Virginia, appellate court judges have to run a full campaign. Not surprisingly, the results have been judges who are swayed, not by law but by the companies and supporters that fund their campaigns. To the extent possible government, especially those who interpret the law should be a meritocracy; I find it hard to believe anyone does not want this for Tennessee. I went to the Frist Art Center yesterday in Nashville, TN. The 2 exhibits the Frist have currently, Norman Rockwell and 30 Americans, work well together. I am only sorry I did not have as much time as I wished to peruse the 30 Americans. A lot of the work in that exhibit needed much more contemplation time. One that struck me immediately as working well with the Norman Rockwell exhibit was a Duchamp type piece. An old carpet, from the artist’s grandmother’s home, was hung on the wall. Others were centered more obviously on race than most of Norman Rockwell’s mainstream art. I also enjoyed many of the works on a pure visual level, the colors and the textures. Rockwell uses humor more than could be seen in the 30 Americans, plus it is much easier to see Rockwell’s intent. I recommend a visit to the Frist. Cambodia: We had 14 days there. We spent about 5 days in Siem Reap seeing the various temples and birding. At one of the temples we had parakeets hanging around long enough to get great views of the color. People kept wandering by staring, trying to tell what we were doing looking up into the trees and not at the temple. We also had a day while in Siem Reap to bird and visit the floating villages on the large interior lake, Tonle Sap Lake. They have been having an unusually rainy season, which has extended into the ‘in-between’ season. The lake was very large with many islands of tree tops. I found the ground around the temples unique. I plan at least a couple of paintings hoping to catch that feel. The rest of the time in Cambodia we spent birding. We first went north, then east to the highlands, and finally west near the shoreline in the Gulf of Thailand. Cambodia traffic is like and not-like that in Vietnam, much less hectic, though no noticeable traffic laws. People drove at leisurely paces. The driver would politely honk to let bikes, pedestrians, dogs, motor bikes, cars, and trucks know when they were passing. It was rather like biking in a park letting people know you were passing them on the left. If someone was turning left but first drove in the left lane right towards you, you just moved to veer around them. The roads are not in the best condition- those rains could wash a lot of the road away. And a lot of the roads are mud which could be as slick as ice to walk on or wet enough for the vehicle to become stuck. But the people take things calmly and no one appears to suffer road rage there. We went to an area called Siema protected forest. The two kinds of endangered Ibis that can only be found in Cambodia roosted in the area. I found out how difficult it is to walk in rice fields trekking out to the roosting spots. We walked out in the day time and back after dark. It had been hard enough to walk when I could see. At least the mud is soft to land in. We could not go to our next planned area where we could have seen the endangered fresh water dolphins due to the unexpected late rainfalls. We went to another national park. Since it was so green we were unable to see many birds. My attention was distracted from the birds anyway. I got some nice close up views of leeches as I kept pulling them off my clothing. David mentioned that the birds were up in the trees, not at my feet. We did see the Cambodian peafowl which is green while the Indian peafowl is blue. Cambodia has very few breeding pairs. We were pleased to see a couple. Our next stop was near Bokor national park. It is a mountain area under development to grow the casino and become luxury villas; unfortunately, destroying the forest along the way. Again the rain keeping the leaves full and green meant fewer birds to be seen. We heard many more everywhere than we could see. We were unable to see the local partridge even though we kept trying at various times of the day. We did see the spectacular Giant Hornbill there on several occasions. They are impressive birds. We just got back from a trip. We had to fly through Ho Chi Minh City on our way to a birding trip in Cambodia, so we stayed a couple of nights. We had been to Vietnam back in 2000. The city this year was much more vibrant, more cars and motorbikes. Even before the traffic was confusing now it seemed an accident was about to happen every few minutes. The 2nd night there we took a motorbike tour of the city. The bikes created a great breeze. The city is lit with colorful lights from all the small businesses. Since I have not had much experience on motorbikes I found just allowing my eyes to see all the lights and movement as blurs was very relaxing. Otherwise I was too aware of how close another bike, car or bus was to my exposed legs. We were told the first rule of traffic is: do not hit anything. Other than that anything goes. They have some traffic lights now which we were told prevents traffic jams. They also made it easier to cross the street. The trick before (and still is for most streets) just to start walking at a steady slow pace allowing the cars and motorbikes to avoid you. Those of you from Charleston, WV would feel at home when you see the Diamond Department store. I did not see a Stone and Thomas. The next day we left for Cambodia. I just got back from a trip to Cambodia, more about that in another blog. I thought first I would share a bit about my process. I finished a painting just before we left for Cambodia. In between finishing the painting and leaving I got two new canvasses ready. I have my own specialist to build my stretches, my husband. We buy the wood we will need and leave it to season before making the stretchers. Since I found primed canvass sticking to the stretcher wood causes a line, David & I have tried various methods to avoid that line. We have ended up with a design that wood touching stretched canvas is at a minimum and that the underlying support is strong but not too heavy. David builds the canvas to exactly match the size I envision for the next painting or two. I stretch and prime the canvas, which takes a few days since I sand the canvas between coats of primer. As you can see in this photo I like to have the canvas with a base color, it does not matter what color. I find a blank white canvas too empty to proceed. 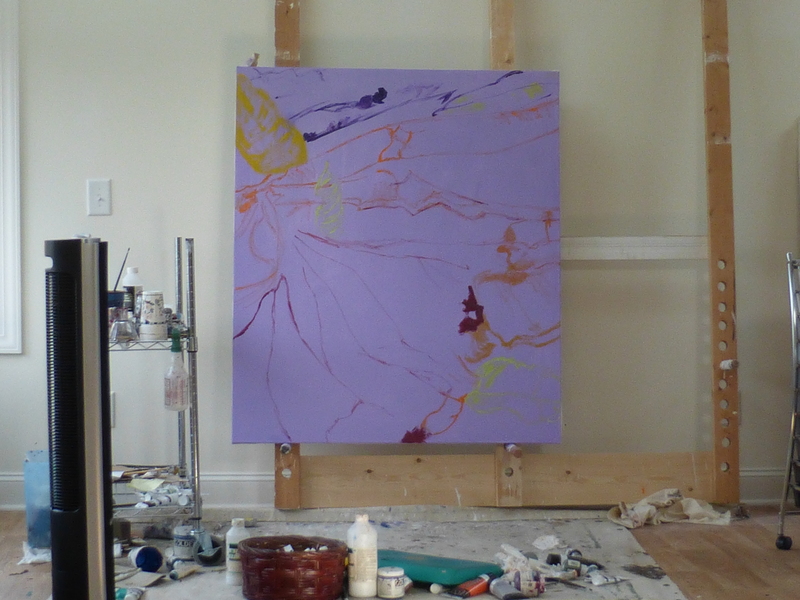 Next I will start blocking in how I plan on dividing the canvas. Trying to put down the beginning of my idea can take much longer than the actual painting once it flows. Getting invited to a solo exhibition at Vanderbilt’s Sarratt Gallery back in April was exciting to say the least, and since my show would be scheduled for Sept. 1-Oct 11, we decided on an “Early Fall” theme. David Heustess, of Saratt, was a pleasure to work with and the set-up, lighting, and arrangements were superb. David reports that he received much positive feedback, and the show has been extended through Nov. 8th, though moved to the ACE wing of Sarratt Student Center Building. I hope people will continue coming to see my work in this new space. The theme “Early Fall” reflects mainly the color palette, as well as the compositions themselves. For these paintings I invite the viewer to see their own dreams. Though my paintings are nominally of minute settings in nature, they are an abstraction of nature. I try to transform reality—biopsies, if you will, that capture a moment. Up close I see details, which upon distancing myself, become decaying leaves, a stick or a frozen pond. These details are forms woven together, crawling, one over another, forms that can separate, move off, little creatures intent on individual activities or forms that ooze together to become creeping masses with only one purpose; forms triggered by my emotions and dreams. I also like to use color to express the feelings I would like to express. So though the color is based on nature I shade them to a more intense version of nature’s palate. This is the basis of my expression. It is determined wholly by my perceptions. My canvass is that which allows vent for this expression.